The OFFICIAL VIDEO of the Royal Gorge Steam Special, the last steam passenger train to operate through Colorado's 1000 foot deep Royal Gorge in June, 1997. U.P. has since closed the Tennessee Pass line. Valhalla Video Productions was selected by the Central Coast Chapter of the National Railway Historical Society to produce this video. Valhalla had 5 camera crews on board and trackside capturing this exceptional trip. 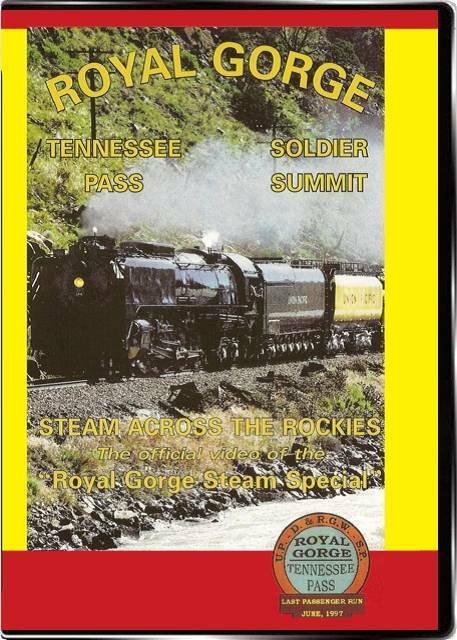 Also includes historic footage of D&RGW passenger trains in the Gorge. Features Hi-Fi stereo sound, maps, and narration. Packaged in durable plastic library case with printed full color cover. Length 82 minutes on DVD. One of our all time best selling videos. The scenes through the Royal Gorge alone are worth the price of the program. Steamboy (Revere MA US) on 2017-06-21 19:48:18. Now celebrating its 20th anniversary, one of Americas most popular steam railroading events for 1997, would still bring back the nostalgia of the final run of this soon to be abandoned mainline between dotsero and canon city Colorado.